Classes will be playful and challenging, seeking to nurture the inner spirit of each child and help them grow in interpersonal life skills. Each class will focus on a new theme based on the letter of the week. Along with learning new yoga poses, classes include elements of art, breath work, partner poses, cooperative games, and community dialogue. We will have lots of fun learning and practicing yoga together! Our Fall Theme is B-A-L-A-N-C-E, our Winter Theme is S-A-N-T-O-S-H-A (contentment), and our Spring Theme is A-N-A-T-O-M-Y. Caregivers and parents are invited to engage with your child’s experience through a Homework Handout each week. The handouts describe the theme of the week and have a parent/child activity to tryout together at home. By experiencing an aspect of what your child learned in class, we hope that together you can share yoga, share life, and share peace. 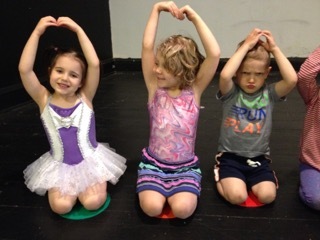 Using the best elements of yoga, dance and tumbling techniques, preschoolers find a million different ways to see and be each shape! We might try yoga poses, make and listen to music, read stories, and use props (cones, parachute, pillowcases, Hoberman sphere) to learn more about our theme shape. We will also create art, spend big energy jumping and leaping, travel through an obstacle course to try tumbling skills, and sing a special goodbye song. Whew! 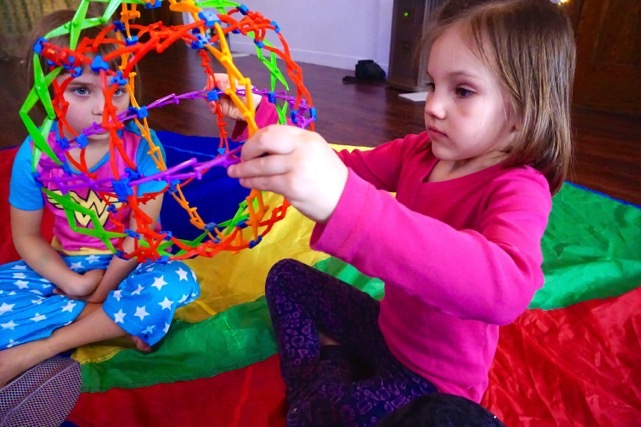 And this is all done in an environment of loving-kindness where your child’s creative spirit and individuality are valued above all else.This play and practice will stimulate positive formation in all areas of child development; cognitive, social, emotional, physical and spiritual. 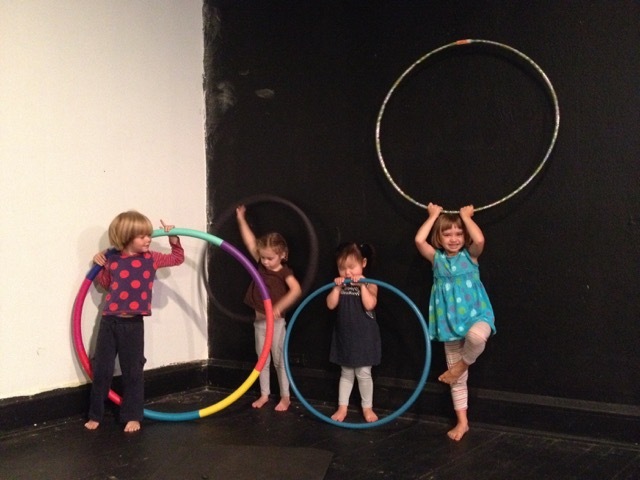 Preschoolers love to perform, so during the final class of each series, students will perform for you onstage! This sweet, simple show builds confidence and community, and there are no costumes or shoes required. An exciting opportunity for girls who are looking for a place to connect, increase self and body-awareness, and gain physical strength and flexibility. In our safe environment, friendships will blossom while discovering how yoga can inspire greater self-confidence, mindfulness and inner-strength. Practicing breath, movement, mindfulness and meditation will enable these young women to build resiliency and leave with tools to better care for themselves and during their teen years and beyond. Chelsea Schmitz is a former high school educator and currently works as a juvenile advocacy attorney and restorative facilitator in public schools around the Twin Cities. She is has extensive experience working with youth and is repeatedly inspired by their strength, resiliency, creativity and honesty. Classes will be judgment-free and limited to 12 students. All are welcome! No yoga experience necessary. Bring your friends. Mats and yoga props are available. Register under the 'classes/workshops' tab. 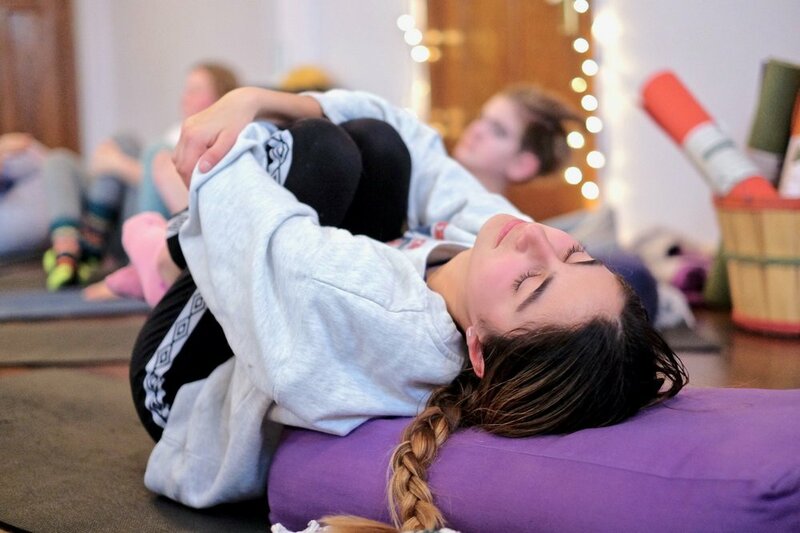 Come join Teen Yoga Teacher Chelsea Schmitz this summer for Yoga Sanctuary’s first-ever Teen Yoga Retreat, July 10-12 in Detroit Lakes, Minnesota! We’ll spend three days and two nights away from the distractions and pressures of ‘city life’, connecting more deeply with self and others. Chelsea will offer engaging activities that will help each teen add to their social-emotional toolbox. And, we will have so much fun together! We’ll focus on community-building through activities and games and we’ll practice teamwork through a variety of lenses, including family-style cooking. If your yogini has a favorite recipe, pass it along to Chelsea and we’ll try to include it in our meal planning. Youth will engage in daily yoga practice and guided meditation in a variety of outdoors settings (including on the lake!) We’ll stay at a large cabin on 5 acres of land on Pearl Lake, with a private dock, pontoon, and bonfire pit nestled in the sand for our enjoyment. The cost for this retreat is $255, which includes: travel expenses (we will rent a 15 passenger van), lodging, meals, crafting, activities, Chelsea’s leadership and a second adult staff. If your daughter is interested in attending but a financial constraint is holding you back, please contact Chelsea. Registration will be limited to 14. Please pre-register at www.YogaSanctuaryMpls.com (under the Youth Yoga tab).